This project requires planning and time. You’ll need a few days in between painting, drying, cutting, and gluing. It is helpful to have an Eric Carle illustration of a specific animal to guide your art making. For suggestions on selecting an animal see the Tips section below. When you have selected an animal, gather poster boards and paint in the colors used in the illustration. For example, when we made a zebra, we used white and blue posterboard and white, blue, and black paint. Look at the Eric Carle illustration of your selected animal and decide what shapes you will need to cut out to create the different body parts after the paint has dried. This will help determine how many poster boards you need. I found it helpful to make a list of the colors and shapes we would need for the finished animal. For example, black paint on blue poster board for the zebra’s stripes and white and just a tad of blue paint for the zebras body. Take your poster boards and paint outside. Drop paint on the poster board and encourage your little artist to move the paint around to cover the entire surface. Use popsicle sticks, hands, and anything else in arms reach to create crazy lines in the paint. This is a great opportunity to get silly and move around. After paintings are dry, cut out the shapes needed for the body – tracing and cutting out the shapes is a step best completed by an adult outside of classroom or instruction time. Gather your shapes, sit down with your little artist/s and “put the puzzle together.” As a team, decide where each shape belongs. Which shapes work best as legs and hooves? Where do the stripes and hair belong? Using lots of glue, attach the pieces of the puzzle together and allow to dry. When I taught this project at my son’s school, we created classroom mascots – monkeys, zebras, cheetahs, and panthers. Eric Carle created illustrations of an almost endless number of animals, so if you have something in mind, you can probably find an example in one of his books. If you do not have a preference, simply flip through his books with your little artist until you spy something you like. There is no right or wrong way to paint the poster boards, as long as your finished paintings have lots of crazy lines and textures. The artists in my class were painting on the playground, dirt and leaves ended up mixed in the paint, and one student even rode a tricycle over the poster boards when we weren’t looking! All of the above created fun textures in our finished paintings. While this project requires more preparation time than others, the finished product is a delightful addition to classroom and bedroom walls. 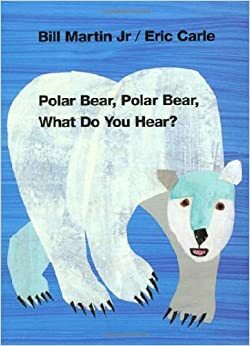 Before or after your Eric Carle inspired animal project, read the books Polar Bear Polar Bear What Do You Hear and Brown Bear Brown Bear What Do You See by Eric Carle together with your little artist.